One of my parents favourite places to go for lunch when they still lived in Edinburgh was the Apiary on Newington Road, so when my dad was through for lunch last Sunday, we decided to give one of their sister restaurants a go. Educated Flea is the newest restaurant by the Three Birds team located on Broughton Street that, much like the Apiary, features a really unique menu you won't find elsewhere. What we love most about the Apiary (and now the Educated Flea as well) is the risks they take with their flavour combinations. You just don't see starters like 'mussel and amaranth croquette with smoked avocado and beetroot guacamole' every day! As unusual as some of their food combinations sound, they are always delicious. These guys really know their stuff when it comes to flavours. At all three of their restaurants (the Apiary, Educated Flea and Three Birds) their daytime menus are 2 courses for £10 (starter and main, or main and dessert) which is great value for money. On weekends you can also mix and match with their Brunch menu. Their Brunch menu changes daily and each item is available in starter or main size. If you're just popping in for a drink and a nibble, the Educated Flea offers a selection of share platters that sound delicious. For something smaller, I could not recommend the pistachio and feta dip with corn chips from the side bar more, I love it so much I find it so difficult not to order it instead of a starter (and it's available in all three restaurants). I took a starter from the Brunch menu which was a duck confit hashcake with a poached egg and hollandaise sauce. As a main I had the 2-way seafood taco (which I sadly had one way because I couldn't handle a hard tortilla with my current wisdom teeth pains) stuffed with prawns, squid and white fish. The spices on the seafood was amazing with just the right kick. I also had a wee bite of my dad's main, the mirin glazed pork shoulder, which was really lovely and sweet. Despite being completely full we couldn't resist ordering desserts. 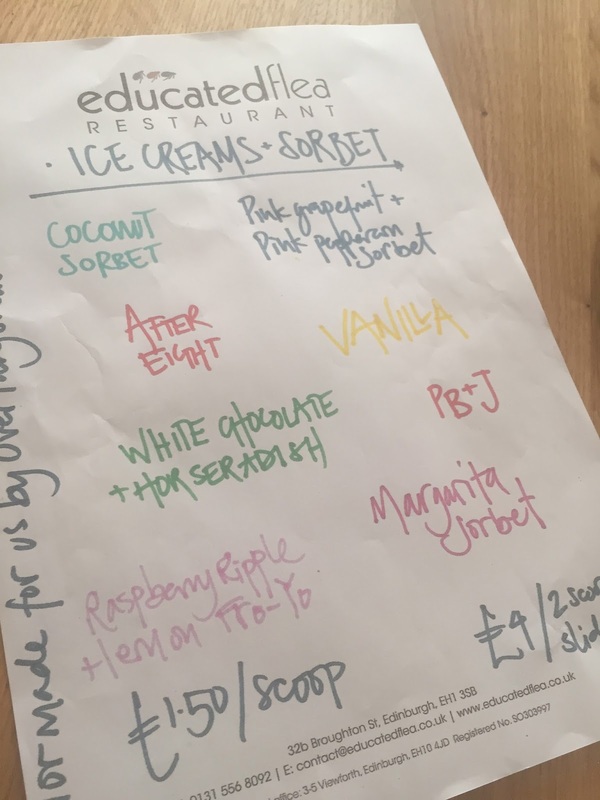 All three restaurants have an ice cream and sorbet menu which features some flavours you've never seen before like white chocolate and horseradish or blue cheese! But don't be afraid to give them a go – my Mum loves the white chocolate and horseradish. I went for a Nutella roulade which I'm sure I don't need to explain, you just know that's going to be incredible. I'd also like to take a minute to rave about the service. All the staff I've ever been served by in both the Educated Flea and the Apiary are beyond friendly. I think that's another reason my Dad loves these restaurants so much – the staff indulge in his terrible banter! No, but they are seriously some of the friendliest staff I've come across and it really makes you want to come back again and again. The Educate Flea also runs Half Price Tester Days when they are changing things about on their menus. In exchange for being guinea pigs and testing out their new food adventures your meal will be half price, which is a pretty good deal if you ask me. The tester days for October are Tuesday 4th and Wednesday 5th – so get booking! So if you're looking for a really unique meal with unexpected flavour combinations, look no further than the Educated Flea (or if you're going to look further then go to the Apiary or the Three Birds because they're all delicious).